An Antique Map of the County of Northumberland Divided into Wards by Thomas Dix. London Published Jan 1, 1819 by W Darton Jnr Holborn Hill. Topographic base coloured to show the new parish and county boundaries as settled by the Scottish Boundary Commissioners. Relief shown by contours and spot heights. Hardback, with large map folded between covers, attached to the inside of the back cover. All five maps are in good vintage condition. Please feel free to email enquiries and to browse our eBay shop revivedprints. Folding linen backed coloured map Walker's Berkshire. Folding linen backed coloured map Walker's Wiltshire. Date Published: 1939. Location Code: England. Verso: may have another map or txt on the reverse. From a disbound guide book. You can also collect this from the Erdington area of Birmingham. Christopher Saxton. This particular example is either from the 1610 or 1637 edition as there is no Latin text on the reverse. No plate number. Hand Coloured Original Map. The margins are wide. Foxing and tanning to the map. Date Published: 1883. Location Code: North Wales. Verso: blank on the reverse. Date Published: 1885. Location Code: Gazetteer, Scotland P6. Blank on the reverse. It has been removed from "The Ordnance Gazetteer of Scotland” published by Thomas C. Jack of London in 1885. I would describe this print as being in good clean condition with nice bright colours, (ideal for framing) the paper is slightly yellowed as you would expect in any print that is 133 years old. Thank you for looking at this item. Date: 1904 Size: please see my photos Condition: very good, see photos, we provide quality photographs and these should studied as they form part of the description. 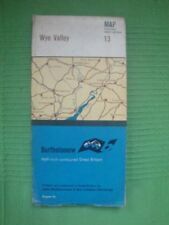 Verso: Your map is blank on the reverse Notes: saved from a disbound atlas Please our full range of Maps in our ebay store. 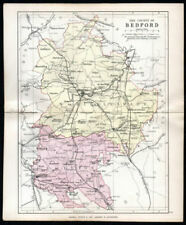 However a nice collectable map and ideal addition to any collection. Collection also available from NR16 area. Location Code: Dartmoor. Date Published: c1960. Verso: your item has unrelated text and images on the reverse. For Tourists & Cyclists. Sheet 28 - Bath & Bristol. Coloured, mounted on cloth. Sheet 9 - Leicester. A semi retired, mature, granddad, downsizing the treasured ‘Junk’ I’ve collected over the years. as decency, good manners and my knowledge of an item dictates. Cover and map in Excellent Condition. Original Antique 18th Century copperplate map in it's original, non-coloured state, from Hasted's History of Kent, published in 1797 –. PROVENANCE: The History and Topographical Survey of The County of Kent by Edward Hasted. Location Code: Cotswolds. Date Published: 1967. Verso: your item has unrelated text and images on the reverse. A NEW MAP OF THE COUNTRY ROUND MANCHESTER. Despite its signs of age, the map forms an impressive record of late 18th century Manchester and district. Thank you for looking at this vintage map. Date:1926 Size: Please see my photos, shown in Centimetres Condition: good We provide quality photographs and these should studied as they form part of the description. Verso: Your map is blank on the reverse Notes: saved from a disbound Book England. Location Code: North Wales. Date Published: 1960. PROVENANCE: The History and Topographical Survey of The County of Kent by Edward Hasted. Published by W Bristow, The Parade, Canterbury. A `Hundred' stems from Anglo-Saxon when the community was made up of `tithes' (a ten household unit), which was responsible to the `Hundred Court' (normally consisting of ten ` tithes'), and `lathes' (into which the Hundreds were grouped). THIS IS A LARGE FOLDING MAP SO IT DOES HAVE CREASE FOLDS. ALL PRINTS ARE ORIGINALS AND NOT MODERN REPRODUCTIONS. PROVENANCE: The History and Topographical Survey of The County of Kent by Edward Hasted. Published by W Bristow, The Parade, Canterbury. I would describe this print as being in good clean condition with nice bright colours, (ideal for framing) the paper is slightly yellowed as you would expect in any print that is 133 years old. This is aFOLDED MAP that has two fold lines across its width. They were the result of detailed survey work by William Gardner, Thomas Yeakell, and Thomas Gream. This survey was carried just before the Ordnance Survey began their work (Gream and Yeakall worked for the Board of Ordnance). Thank you for looking at this item. Date: 1904 Size: 34x51cm, Condition: good, we provide quality photographs and these should studied as they form part of the description. 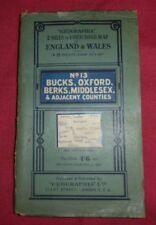 Verso: Your map is blank on the reverse Notes: saved from a disbound atlas Please our full range of Maps in our ebay store. Engraved by W.H. Lizars. It has been removed from "The Ordanance Gazetteer of Scotland” published by Thomas C. Jack of London in 1885. I would describe this print as being in good clean condition with nice bright colours, (ideal for framing) the paper is slightly yellowed as you would expect in any print that is 133 years old. Thank you for looking at this item. Date: 1933 Size: Please see my photos Condition: good We provide quality photographs and these should studied as they form part of the description. Verso: Your item is blank on the reverse Notes: saved from a disbound book. Thank you for looking at this item. Date: 1887 Size: Please see my photos Condition: good We provide quality photographs and these should studied as they form part of the description. Verso: Your item is blank on the reverse Notes: Scotland lowlands. Original Antique 18th Century copperplate map in its original, non-coloured state, from Hasted's History of Kent, published in 1797 by Bayly sculp London–. PROVENANCE: The History and Topographical Survey of The County of Kent by Edward Hasted. Engraved by Sidney Hall. The map was first issued c1833, and seems to have been issued as a folding map from c1842. Condition: Slipcase with signs of wear, but just about holding together at the sides.